"Mountain Prints; Watercolour Paintings; Limited Edition Prints; Shops mountain art scotland; UK stockists Scotland England Wales; Neil J Barlow"
If you prefer conventional shopping, our prints are on sale in shops and galleries throughout Scotland, and at a number of locations in England and Wales. Few shops stock everything we produce but many keep an extensive selection of ready-mounted prints and all can order prints for you. 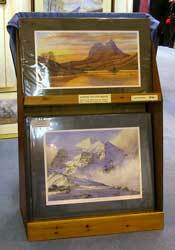 A small number of galleries and shops also stock Original Watercolours. W= Watercolours. P=Prints. E=Extensive Range. L=Limited Range.